PARENTAL SUPERVISION IS RECOMMENDED AT ALL TIMES!!! This section is destined for you to learn how to fill a pinata if this is your first time. We have two choices from which you can select. The first one is the below set of instructions that should make the process fast and easy. The second option is to click on the button on the left side of your screen to have an animated step by step guide on how to fill your party game piñata. 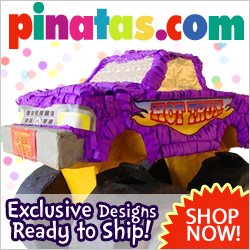 All piñatas come with a round sticker that reads “TO OPEN PRESS HERE” . Gently press down on this spot through the tissue paper. This spot will usually give to gentle pressure. If you have any trouble opening the tab, using a sharp box cutter or scissors, cut a U shaped opening on this spot. Lift the lid towards you and fill the opening with candy and/or party favors . For your convenience we offer piñata stuffers .